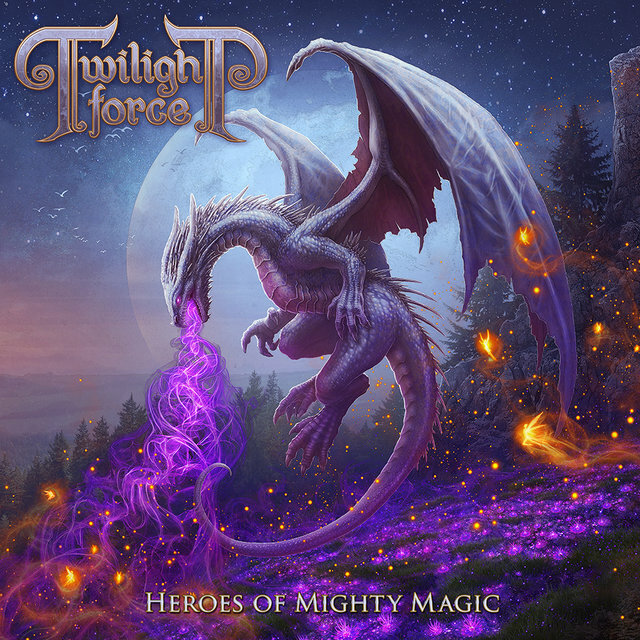 Twilight Force, een beter synoniem voor power metal vind je tegenwoordig niet. Ze brengen hun nieuw album 'Heroes of Mighty Magic' uit dat de kern van power metal vervat. Ter ere van dat nieuw album hadden we een gesprek met de heren. How did you guys start out as Twilight Force and make the first album ‘Tales of Ancient Prophecies’? As the prophecies foretold, Twilight Force came into existence as the inevitable consequence of the musical collaboration between Lynd and Blackwald. ‘Tales of Ancient Prophecies’ took shape during many years and long nights filled with mirth and creativity. The quest and goal to revive and honor the golden age of power metal was defined from the first note until the very last; and the response to our first opus has hitherto been overwhelming. So it is with much excitement and anticipation, as well as a tingling anxiety, that we now take further trembling steps out into this new and hopefully invigorating era of adventure metal. Can you tell something about the genre you play, because there aren't a lot of bands that play adventure metal. That is most true indeed. Adventure Metal is our creation and our sigil. We aim to carry onwards the everlasting flame of power metal from decades ago; but it is now begilded and ennobled to fully represent the deeply ingrained force and wisdom that was once part of the genre. Adventure Metal is to us the most refined and intense manifestation of power metal, and the next essential step in its evolution. It is also the supreme synergy and merging of contemporary sounds and a motion picture tonal language. An intricate yet memorable soundscape filled with magic, wonder and mythic tales. We did not choose the genre; the genre chose us. It spoke to us from the magical depths of mysteries and prophecies. And our hearts could naught but heed its call. The path and quest we have now undertaken is beyond even our own comprehension, but we will honor this devotion until the end of ages, and into horizons and realms unknown. Is it correct that you have a classical music background? What kind of influence does this have on your music? Yes, that is correct. Lynd and Blackwald have both trained at venerable musicians guilds since their early years, and we all possess long musical backgrounds in different constellations and ventures. The classical training has undeniably influenced the way in which we compose and arrange our music; and we definitely have much to thank our knowledge of the dynamics of an orchestra and different traditional musical techniques. Where do you get your creativity from when you write songs? Our influences are numerous and diverse indeed. We gain influence and creativity from the world around us, the nature and beauty of imaginary worlds, and the bliss and serenity of reveries, dreams and imagination. Also from literature, great composers and contemporary culture. The creative process is not something we need to seek out or nurture; it comes to us naturally and magically. The real struggles lie within the arrangements and performances. While the outlines of a musical piece is rather swiftly conceived, the orchestration and endless exploration of different soundscapes and possibilities are what constitutes the lion’s share of our efforts and time. What is the concept behind the new album ‘Heroes of Mighty Magic’? Musically, our concept was to further explore and evolve our sound and to delve deeper into the musical landscape of the aforementioned motion picture oriented tonal language. It was merely a natural step for us to take however. A lot of emphasis has been put on orchestrations and arrangements, while still maintaining the essence of our foundation - memorable melodies and accessible soundscapes. Subsequently; upon experiencing our second opus, we hope that our honored listeners will be able to discover and discern additional and exciting details and traits in the periphery of the arrangements well into many listenings. So in a way, we have strived for ‘complex simplicity’, if you will. Conceptually, we have put a lot of time and effort into unveiling the lore and tales of our realm, The Twilight Kingdoms, and much of what has hitherto been held in mystery shall finally be revealed on 'Heroes of Mighty Magic'. So prepare for a magical journey across mythical kingdoms and arcane prophecies. How did the recording process go? Do you all write together? All the material on 'Heroes of Mighty Magic' is composed and arranged by Lynd and Blackwald. And a better part of the opus was eternalised in our own studio, The Twilight Forge; even though we did utilise several other facilities and locations for specific elements and purposes. When a composition and arrangement was completed for a certain piece and the meticulous trial and errors had all been made, all members joined in to add the individual performances to the groundwork. It is a splendidly efficient and rewarding way to create, giving us all the options and time we need to revise and redo until everything is to everyone's satisfaction. How would you compare this new album to the previous ones? The differences between the two albums are truly vast; but there is still a strong sense of familiarity and connection between the two. 'Heroes of Mighty Magic' is far more complex in its arrangements, orchestrations and song structures. And all performances on the album undoubtedly outshines anything on our previous one. But our main focus has still been memorable melodies and motifs, intense swiftness and an accessible & familiar tonal language. We have however aimed to evolve the sense of adventure, gleefulness and glory to soar over even the highest of thunder ridden mountaintops. We have also, as previously mentioned, put much more weight on the storytelling and universe, to bring the lore, tales and prophecies of the Twilight Kingdoms into light. You worked together with Fabio Lione (from Rhapsody Of Fire) for a track, why did you choose him as a guest? We are beyond thrilled to have such a venerable titan of the genre contributing to our upcoming opus. Fabio was, incidentally, on tour with Rhapsody Of Fire at the time, and was about to perform at Sabaton Open Air here in our home town. Thus, the opportunity arose to conveniently record him with very little logistical trouble. We brought him to our studio and played him the material, and his wondrous musicality really brought a magical spark of life to the song. Interestingly enough, only a fraction of the song ‘There and Back Again’ was actually completed at the time of the Fabio recording, but he still managed to embrace the mood and feeling we desired, and we were able to put it all together when the song was finally completed. For the title track you work together with another great artist, Joakim Brodén (from Sabaton), how did he fit in the picture? Yes, we truly are humbled beyond words that Joakim wanted to collaborate with us. Joakim and Sabaton are long time friends of ours, and to have him perform on this album too is a great privilege and an honor. Ever since his astounding vocal performance on our previous album, we knew that we somehow wanted to incorporate his thunderous vocal resources in the future too. And to our joy, he happily agreed to participate once again. So when the time came, we found the absolute perfect section for Joakims voice, and he made that part of the title track take to the skies like the soaring flames from a legendary arch-dragon. Absolutely amazing. You will play at Sabaton Open Air 2016, how excited are you guys to play on this great festival? It is our second time performing there, and since the festival is held in our home town, we are very familiar with everything surrounding this glorious spectacle. We really enjoy the festival and have been avid visitors for many years now. It is a great and friendly environment, and a really rewarding place to spend some of summer’s last days. For Sabaton to have created such a legendary melting pot of wonderful people and music in our shared humble home town is a truly remarkable accomplishment, and they deserve much praise for all their efforts and achievements. We are indeed very excited to perform at SOA once again, and we will do all in our magical power to create a truly memorable experience for everyone. And what do you think about the timetable, playing after Sabaton as the last band of the festival? Now that will prove a challenge indeed! But it is also an immense honor. To carry the torch onwards into the night, after one of Sabaton’s stellar performances and stage shows, is going to be a great challenge, but not something we fear! This will be our opportunity to honor our venerated brethren in Sabaton by giving their audience a little something extra to complete their night and festival experience. The only fear we have, is that the mead barrels and wine carafes will have all been emptied by the time we enter the stage, haha. What are some funny/great memories when you were recording an album? There are numerous anecdotes over the years containing dragonfire, magic potions, necromancy and whatnot. Alas, those are tales for another time. One thing that comes to mind however, and that had us in tears for the better part of a day, was when Blackwalds’ choir performance resulted in bloodshed and a split lip. Something that might perhaps not sound very amusing on paper, but mark our words, what was recorded in that flash of pain and regret, was ludicrously entertaining. What are some funny/great memories from when you were touring or playing a show? Our protective magic has proved invaluable to any misfortunes we may potentially have suffered. However, spells of protection are not always to be trusted. They may behave erratically when performed negligently or without proper and meticulous preparations. One of such occurrences happened in Switzerland when we performed with Gloryhammer. Their poisonous potions did not sit well with some of us. Hence, as a result, we had to travel far and wide to seek out healers and the shamans of the mountains to restore the afflicted to their former glory. Moral of the story is to never trust another man’s decoction. It is us who shall thank thee! May the power of the dragon be with you!